(Newser) – Seahorses, known not only for their funky shape but also for being monogamous and for the odd trait that it's the males who give birth, might be in more trouble than thought. It's long been known that the small fish are just one of many to get caught up in fishermen's nets, but new research in the journal Fisheries suggests that millions more than previously realized are dying every year because of the problem. Haikai magazine calls it an "accidental slaughter" of some 37 million seahorses annually, based on data gathered from surveys and field tests in 22 countries. That figure is about six times higher than previous estimates, which might help explain why many of the 41 species of seahorses around the world are now deemed vulnerable or near threatened, per National Geographic. 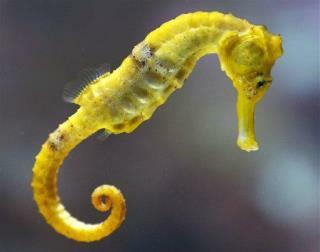 The article's meaningless without giving us the total number of seahorses in the world. The annual catch could be 10% or it could be .0001% of the worlds population. I tried to find the number but the first four articles I checked all hinted at a crisis but admitted that they didn't know what proportion was being harvested. I smell an agenda. Deliberate misinformation doesn't help causes, it just sows mistrust and confusion. Let's just stipulate that humans will just continue to grow their population until we kill off damn near everything. Oh, and let's also stipulate that the Chinese will kill off everything in search of a woody. "These people are often very poor, and they need to feed their kids" With 7.3 billion people on this planet perhaps we should start talking about the wisdom of having all these kids that need to be fed.